I have to say, I think the Irish have a real entrepreneurial spirit! So I went out with my Uncle Joey last night. So funny that I have a relative living just two hours away, on the other side of the Atlantic from home! He took me out for a meal (very nice; Tante Zoe's). Uncle Joey has never been a sharp dresser, so when I saw his obviously new shirt, I realised that this was an occasion. Sadly for him, I'd kind of guessed though. Uncle Joey, aged 50-something, came out of the closet!!! To me. I don't think anyone back home knows yet. And I can't imagine that his ex-wife is going to be very nice about it. Anyway, here's the funny thing. He told me that he'd kind of realised for a long time, but because he's so far from the stereotype (not very handsome; a tough, burly, fisherman, rather conservative in most of his views, idea of home decorating doing the dishes once a week or so) he hadn't done anything about it. And because he came to The Dragon in Dublin (with me, because I love the decor there!!) and saw that some of the patrons were middle-aged fellers like himself he decided to just go for it. Well, I wanted to appear amazed but, honestly, I had kind of realised. So I just said that if he was happy, I was happy, and asked if there was a special person in his life, but he said he wasn't ready to talk about that yet. So there you have it. I guess there's a Dublin for everyone. It got my uncle out of the closet he's been in all my life. I don't really know what to think. It makes sense, but at the same time, it's strange. Whatever the situation between my uncle and his buddy, I hope buddy'll be kind to him. He might be a big, tough looking guy but he's a softie really and I'm sure this whole thing is difficult sometimes. I'm also coming to a (totally different) realisation of my own. It's forming in the back of my mind right now, but I think I'll make it official soon. Another weekend has come around and it's so warm today you can -- and I am not exaggerating -- sense a promise of summer in the air. My guess is that this year it's going to be glorious. Bepe and I have a teeny-tiny balcony at our apartment, and I've bought one of those mini barbecue-in-a-box things so that we can grill some sausages tonight. I know it'll be chilly by then and that we'll probably be huddling under a blanket by the time they're cooked, but who cares? The Mom whose kids I take care of on Saturdays has asked me to come up with something for them to do this weekend. Usually, she arranges everything and all I have to do is show up and watch them. I was thinking maybe the Botanic Gardens? I've been there before, but not at this time of years, and it's got to be pretty, with all the spring flowers come out and stuff. Thing is, they are rather -- how can I put this -- energetic kids. Some would say "destructive", but let's not go there. My thinking is that there are lots of trees, and there's lots of grass and if I get them to run in circles for a while, they'll calm down and then I'll be able to give them their sandwiches. Plus, I'd like to go. With this warmer weather, I feel like being outdoorsy. 1)The nice man in charge of Irish Ferries has given me and a friend a free day trip to Wales! With access to a fancy lounge! I will be blogging about this next week, and plan to have lots of photos. I've never been to Wales before and although I will only be there for a few hours -- exciting!! Plus, the only ferry I've been on before goes from Newfoundland to Nova Scotia, and the views are amazing. I'm really looking forward to seeing Dublin Bay from the water so that I can compare and contrast! Mobile downloads -- don't you just love them! 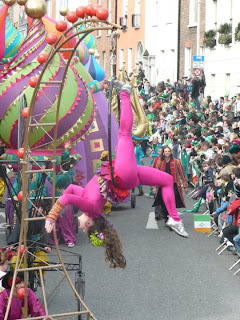 It took about 2 hours to see the whole parade, and I think that girl was upside for most of it! There were performers from all over the world, so far as I could see. 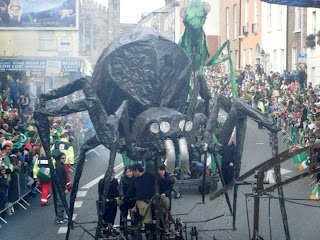 There's something so fantastically...democratic about an event like the St Patrick's Parade. 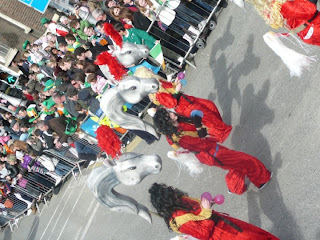 I mean, Irish people often try to present themselves as being a cynical bunch, but the crowd at the parade, Irish and visitors alike were hardly cynical. It was like we were all 6 again, and it was fantastic. And I'll tell you a secret. I used to be in my school band. I loved it, but when I reached about 14, I gave it up because I thought it wasn't cool. Well, after watching the parade last week, I totally regretted hanging up my trombone, because there's just something wonderful about making music as part of a group. And, honestly, who really cares what's passing for cool among a bunch of jaundiced 14-year-olds. Is it too late to start again, I wonder? Anyway. This weekend, I'd been invited to go for a little hike in Howth, but I'd completely forgotten about my Saturday job. Fortunately, the Mom texted me the night before to ask me if I would could meet her with the kids at Cabinteely Park, where one of them was attending a birthday party. The weather was good and the kids were out of doors and I got a ride home so it was a very easy gig this weekend. And just as well, because at college, the pressure is on. I can hardly believe it's nearly April already. The end of my masters, and decision time fast approaching. I am going to have to work super-hard. Fortunately for this literature post-grad, there are some public events coming up that are at least slightly related to my coursework and research, so I guess I can at least attend those with a clear conscience. There's a poetry festival on in Dun Laoighire at the weekend and starting some time next week, Dublin's "One City One Book" thingy, which is kind of a neat idea, as the point is for everyone in Dublin to read the same book, sort of like a giant book club. And this year is really totally relevant to my work in Gothic literature because the book is the Picture of Dorian Gray by Oscar Wilde, which is one of my favourites of all time. Re. poetry, I have to confess that I have never been able to get into it as I have fiction. I am not a very patient person and it can be hard sometimes. But being in Dublin, it's good to have the opportunity to hear poetry being read by real poets in, after all, one of the top places for writing in the English language. I read that, years ago, the ancient Irish bards had to learn how to compose fancy poems while lying naked under a big heap of cold rocks. That's dedication for you.